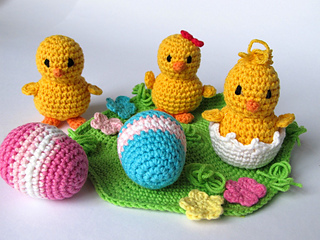 One of my Easter decorations. 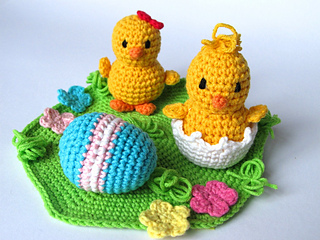 Easter Chicks on a Blossoming Meadow. 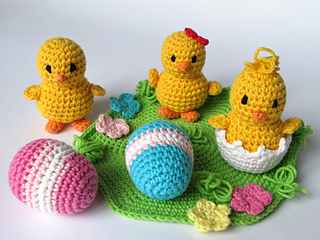 Detailed instructions and pictures help you to crochet all parts of the decoration and put them together to complete the chicks, eggs and the meadow. Sales, duplication and publication (incl. translations) of the instructions (including publication on the Internet). 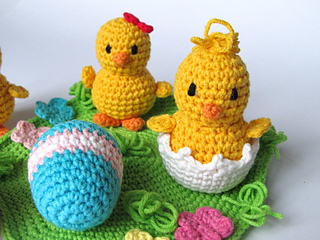 Sales of the ready figure on the Internet are permitted. The local sales of the ready figure (e.g., in stores, at markets) are permitted! In both cases you have to present the designers name.